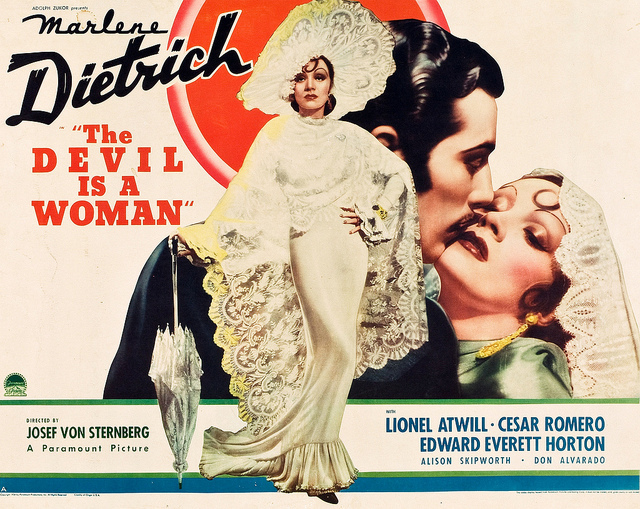 Unlike the last Marlene Dietrich movie I reviewed, this movie is unafraid of Marlene being an outright vamp all of the time. She purrs, squeals, and flutters her fan all while manipulating every single man who comes into her path. The best part of the movie is that she does not deny that she manipulates men. When Antonio chastises her for breaking the heart of his friend, she basically says that he has to be more specific. Marlene dominates every scene she is in with her vivaciousness and her beauty. The camera was made to look at her and the lighting was made to shine on her. In fact the cinematography and set design were probably the best I have seen in a while. The movie takes place in a small town in Spain and it feels like it does (although it is obviously a sound stage). There is one scene that I particularly like the lighting and framing of. This scene happens after Pasqualito takes advantage of Concha after all of the sexual buildup. He is regretting defiling her like that. This is manifested not by any words, but by the stance of Pasqualito shaded against an open balcony door with rain falling on top of him. It is a striking shot and the moment that you start to feel sorry for Pasqualito for being a fool. This movie is filled with great shots. Marlene Dietrich is a feminist role model for many reasons, one of which is being able to play this type of character as her own person. She isn’t just a vixen. She is a well-rounded character that loves, feels and will ultimately do the right thing. I’m so happy that she was able to save this film from being lost after the studio destroyed the negative at the request of the Spanish government.